This week we have the first in a brand new series by E.J. 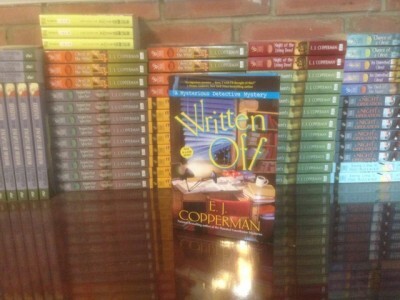 Copperman, along with a fun guest post from E.J. 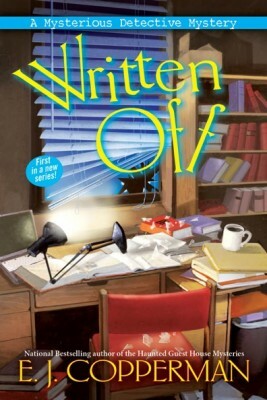 Details at the end of this post on how to enter to win a copy of Written Off, and a link to purchase it from Amazon. Rachel knows she didn’t model her main character after anyone, but here’s Duffy who works as a consultant and specializes in missing persons cases. Oddly enough, he has no memory past the previous four years, just the length of time Rachel’s been writing the fictitious Duffy. Before Rachel can decide if Real Person Duffy is crazy or she herself is, she’s tangled in the case of missing and murdered mystery writers. It’s coming a little too close to home. It seems the killer sends emails typed in different fonts to look like they’ve been cut from magazines. Then the author is kidnapped, held for several days, and killed back at their own home. Now Julia Bledsoe, an author Rachel met and liked, is missing and the clock is ticking. Rachel decides working with Real Person Duffy is better than doing edits and goes along. Real Duffy claims he’s never read her books, but his personality is remarkably similar to Book Duffy’s. He claims that Rachel will have insights the police don’t because she’s a mystery writer, too. When Rachel gets her own email threat, she’s got a vested interest in finding the killer. With research help from her able assistant, Paula (a treasure in the office), Rachel sets to work not only to find a killer but to unravel the mystery of Duffy himself. This is the first in a new series, and it promises to be a good one. Just when you think you have the whole thing figured out, Copperman slips in a killer last line that changes everything and makes you want more—and soon! Rachel is a likable character, true to life and funny. Paula is the office manager we all wish we had. Duffy? Well, there’s no telling what the true story is there, but you won’t want to miss a chance to find out. Copperman writes the Haunted Guesthouse series and co-authors the Asperger’s Mysteries, both enjoyable reads. When you’re a mystery author with a new book coming out, you do your best to let people know it exists. They’ll be interested or not, and I’m convinced there’s no way you can make them salivate over a book if they’re not inclined to anyway. On the occasions when it’s the first book in a new series, the task becomes a tad more complicated. You can’t just tell people, “Hey, it’s another book with the same characters you (hopefully) liked before, but this time in 3-D (or something)!” and have them just rush to the bookstore or the website. You have to explain the premise and make it sound like something the reader will find enticing. In Written Off, Rachel Goldman is a midlist crime fiction author living in northwestern New Jersey not terribly far from the New York State border. She writes a series in which Duffy Madison, a consultant with the Morris County prosecutor’s office (the prosecutors are called in for major crimes quite often in the state), specializes in missing person cases. He’s very good at what he does because he’s passionate about finding the person who has seemingly vanished. Rachel is just finishing her latest manuscript and preparing for the dreaded revision process when her phone rings with a man on the other end. He says he is a consultant with the Bergen County prosecutor’s office, specializing in missing person cases. He says he’s involved in a very tricky case, and he thinks Rachel can be of some help. He says his name is Duffy Madison, and that he believes she created him from thin air when she started writing her books. And that’s when things start to get weird. Before you know it, assuming you’ve read this far, Rachel is trying to help Duffy—because he won’t answer to any other name—find a person who has kidnapped three mystery writers and has now taken a fourth, someone Rachel knows a little bit from the circuit. None of the first three were found alive. She’s called upon to drive around the state and evaluate the latest victim’s home and writing getaway to provide insight into the process that might be helpful and to try to trust a man who can look her in the face and say he has no memories before four years ago because that’s when Rachel started writing him as a character. Now, I’m asking you. How does a writer promote a premise that nutty with readers? I mean, it just took me seven paragraphs to lay out the basics. Marketing people will tell you readers stop paying attention to such blatant sales pitches after, at most, two paragraphs. Yet I think, Written Off, the first Mysterious Detective Mystery, is very accessible to a reader, that Rachel is an appealing character, and Duffy is just odd enough to be intriguing. Hopefully the story will keep you engaged, and you’ll be turning pages to find out if Rachel is next on the killer’s list—I mean, how could I not? But it’s certainly not the same old, same old. So what do you think? How should I make readers aware of this new series and this new book? Any ideas? I’m open to suggestions. Or maybe what you’ve just read is enough. Opinions? To enter to win a copy of Written Off, simply email KRL at krlcontests@gmail[dot]com by replacing the [dot] with a period, and with the subject line “written,” or comment on this article. A winner will be chosen June 25, 2016. U.S. residents only. If entering via email please include your mailing address, and if via comment please include your email address. E.J. Copperman is the author of the Haunted Guesthouse mystery series and the co-author with Jeff Cohen of the Asperger’s Mystery series. On June 14, E.J. unveiled the Mysterious Detective Mystery series in which a crime fiction author is confronted by the flesh-and-blood incarnation of her fictional sleuth. Next year there will be yet another series, but we’ll tell you about it then. Is she or isn’t she. That is the question. Does she have a split personality? Is she in an alternate reality? Does he have a mixed personality disorder? (A mixed personalty disorder, you can catch with his hand in the cookie jar, he can have cookie crumbs on his lips and shirt and he can say “No I didn’t” and you will want to believe him so sincere and sounds so sincere and will look ssoooo distressed that you would think he would ever do such a thing). Looks like a very engaging read. Would like to see where she takes this. If its a cozy I want to read!!!!! Would really like to “sample” Copperman’s work. The story is very interesting. Wonder if she falls for her “make believe” friend. Sounds like a fantastic book! One I would love to win, if I should be so lucky!! This is a very talented author who writes with humor and well done characters. Having a character come to life sounds like a wonderful plot line. Written Off looks like it will be good! I am looking forward to reading it. Thank you for review of the book. I love finding out about new cozy mysteries to read. Thanks for the opportunity to win a copy of this book. It’s on my want to read list. A mystery writer being a character in a mystery book is a different storyline. Really looking forward to reading. Sounds like a great start to a new series. A recent post from Dianne Casey: Why I Love Rooster Teeth! Sounds like an interesting read. Thank you for the chance. Sounds like an interesting book. I have a few of his other books.